Mick passed away peacefully at his daughter's residence, where he was at home for the last few years. The death on January 5 2019 of Mick Hickey, Moynetemple, Moyne, formerly of Brittas Road, Thurles, Loughmore, Sue Ryder Homes, Holycross and originally the parish of Knockavilla/Donaskeagh, occasioned great sadness across Tipperary where he was very well known and highly respected. Mick passed away peacefully at his daughter's residence, where he was at home for the last few years, following a short illness surrounded by his family at 76 years. He is deeply mourned by his family, daughter Edel (Leahy), son Liam, son in law Joe, adoring grandchildren Emma and Meabh, Marie, cousins, neighbours and a very wide circle of friends. He will also be missed by all his friends in sport, near and far, in particular team mates at Dundrum Athletic Club, Thurles and Templemore Golf Clubs and Tipperary Badminton – sports at which he excelled and made his name at varying stages in his lifetime. The large crowd that attended Hugh Ryan’s Funeral Home and St Mary’s Church Moyne, was testament to the esteem that Mick Hickey was held in both his working and sporting life. Retired revenue collector from Thurles Town Council, fondly known locally as the “Rent Man”, former clients paid tribute to the gentleman that visited their homes weekly always bringing a smile and a kind word. Dwans mineral factory across from where Mick would later live and raise his family in Brittas Road, was his workplace prior to joining the council. Initially on delivery duties and later as a sales rep, colleagues gathered to speak highly of their friend whom they enjoyed meeting daily, sharing stories from their daily excursions from the highways and byways of Tipperary and further afield and all the characters they met along their travels. Representative from all aspects of Mick's life turned out to pay their last respects to a man whom they knew and competed with throughout a tremendous sporting career. Guards of honour were provided as his remains were received into St. Mary's Church, Moyne, for Requiem Mass, celebrated by Fr. Tom Ryan of Sue Ryder in Holycross, assisted by Fr. John Cantwell (U.S.A.) a native of Moyne, and Fr. Thomas O' Connell P.P. Loughmore. His funeral Mass was a true celebration of Mick's life. It was fitting that his coffin was draped in the tricolour as he represented his country in athletics and the flag of Dundrum Athletic club, of which he founding a member. 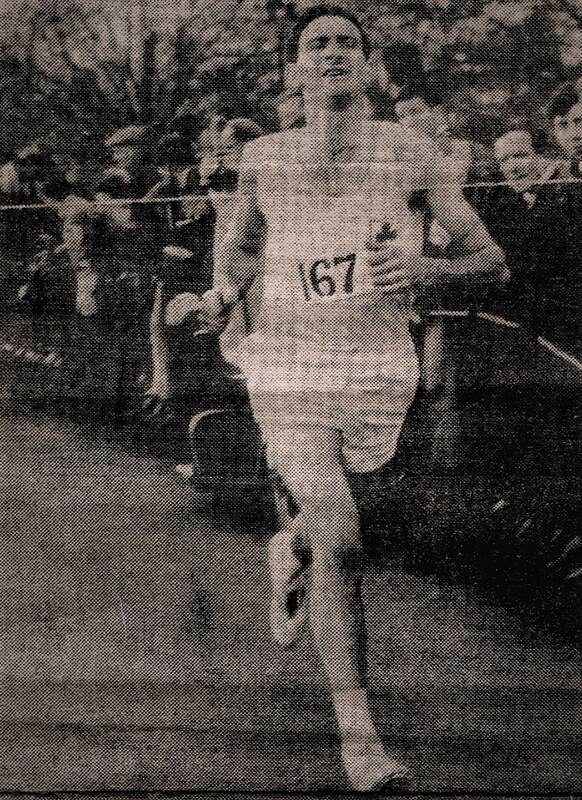 In 1960 Mick Hickey commenced his cross-country running career with Cashel Athletic Club at 17 years of age. As a result of his performance in his first race the Co Youths in Nenagh he found himself on the county team for the Munster Youths championship in Ennis, which he went on to win. The All Ireland was held at Mungret with Hickey in third place. Tipperary won the championship with a total of 41 points. Later that month he went on to win the Co Novice Cross Country Championship over a distance of four miles beating a field of 180 runners. Cycling nightly from Knockavilla to train in Cashel, Hickey and a number of young men from Knockavilla/Dundrum decided they would start their own running club. Dundrum Athletic Club was born along with lifetime friendships. Kelly’s field in Ballygriffin became the training ground for these young men who would go on to do their parish and families proud. Hickey continued his career with great gusto and became the man to beat on the cross country circuit. Friend and running mate Billy O’Dwyer would be his nearest rival and between them they dominated the circuit throughout the 60’s. Hickey won his first senior cross country championship in 1964, captain to his team mates he led by example to lead from the gun. Quoting the caption of the day and what would fondly be referred to going forward was the “great tussle” between Hickey and Dwyer. Spectators and supporters would speak of their anticipation of the meeting of both men and picked their spot to keep sight of who would be victorious on race day. True sportsmen they continued to test and push each other to their best and between them they would win 10 county senior cross country championships. Both men went on to represent their country in Glasgow, International A cross country and continue with the International Military 12 Brigade to championship events in Madrid, Belgium, France, Luxemburg and Tunisia. For his outstanding records in the county, munster and All Ireland events Hickey was recognised and awarded with the Tipperary Sports Star award in 1965 selected by the United Sports Panel, receiving his Cidona Award alongside household names of their disciplines in the county. Admiration for this ongoing success was observed on an international level. A hand written letter received by the chairman of Dundrum AC from the chairman and all the members of the Tipperary hurling and football club, New York in February 1966 echoed the sentiment of great joy and gratitude towards the successes achieved by Mick and his team mate Billy Dwyer. “Putting West Tipperary on top”, “Wishing every success for their upcoming international duty in Luxemburg” and acknowledging that “even 3000 miles away from home it makes us feel good to read about the wonderful work these men are doing in cross country”. As well as cross country, Hickey travelled the country competing in “open sports meetings” and road races, featuring not only in the Tipperary Star/Nationalist articles but pictures were also captured in The People, Irish Press and Irish Independent of Hickey’s victories overcoming the best of the best in the country. Notably in 1966, he was recorded as winning nine golds in open road and cross country meetings around Ireland. No change for 1967 starting the year with headline in the Sports Section of the Irish Independent, “Hickey First by Eight Yards 180 starters in the Oman Cup” run in the Phoneix Park on January 1, 1967. On retirement from his illustrious athletics career, it wasn’t long before Mick Hickey found himself actively involved in sport again. Taking up the game of badminton in the mid 70’s with Boherlahan, like in athletics he demonstrated his commitment and enthusiasm. During this time he would too bring his knowledge and charisma to the Boherlahan Dualla GAA club where he was in modern terms responsible for “strength and conditioning/ fitness” for a few years. A dominant figure in the game of Badminton, he worked his way through the divisions, playing with Boherlahan and later moving to Thurles where he achieved Tipperary division 2 titles at mixed, doubles and singles. At this time badminton matches were played at night and with games not finishing till the early hours it was a true reflection of Mick’s athleticism and vigour. Thurles Golf Club was next on his sporting journey. Now in his 40’s, Mick took up the game. No different to his previous sporting activity he enjoyed perseverance to his sport which saw him get his handicap down to single figures. 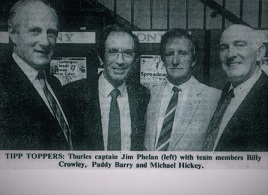 During his time with Thurles Golf Club he enjoyed several victories most notably the Presidents prize in 1985, Sony/Evening Herald Club Medal Golf Championship 1992 played at Royal Dublin Golf Club, alongside team mates Jim Phelan, Billy Crowley and Paddy Barry RIP. The prize for their efforts was the title, but also a trip to Tenerife which was enjoyed by all. 1997 was to see Mick again involved in national honours when he was an integral member of the inaugural Thurles Golf Club Pierce Purcell Shield team to made history in Dundalk. Fittingly this team was honoured for their success by receiving a Tipperary Sports Award which was home turf for Mick as he had previously achieved the same during his athletics career. Following a hip replacement in 2003, Mick resumed his Golf with Templemore Golf Club. Not to be defeated by injury he made his return to golf representing the club at all levels. In particular Mick was a very popular member of the senior circuit. Golf brought Mick the length and breadth of the country and in particular his annual trip to East & West Coast Challenge Competitions, travelling with golf mates from Thurles and Cahir Golf Clubs. On the first weekend in June and first weekend in September respectively, played over four days, touring courses of the area, Mick made some very good and close friends. Following the World Cup win of Irish duo Padraig Harrington and Paul McGinley in 1997, Mick and some of his Thurles golfing buddies headed off to see if they could master the courses of North Carolina. In recent years he enjoyed society golf and travelled to Scotland on two occasions with the Monks Golf Society taking in what Scotland has to offer in golf notably King’s Barns and Carnoustie Golf courses, home to the British Open on a number of occasions. Just to add to the list of achievements, at the age of 56 Mick Hickey cycled to Dublin to support the charity Tipperary Hospice. Not with a carbon framed bike fresh out of the Giant Store but on a bike that needed gentle persuasion when gear changes were required. Golfing buddy Mick O’Dwyer, would also take up the challenge and together they commenced their training which initially started out on a tandum which seemed a good idea at the time!! Both raised staggering funds for the charity. A true sportsman and an ambassador in all his representations, both as an individual and team member, his knowledge in every area of sport was evident in his daily completion of the sports crossword in the Daily Star. Honest, fair, motivated, committed - all words that eloquently describe this sportstar and gentleman. At the Island Crematorium, Mick reached the final destination of his journey. As at the close of every race, where spectators gather in large numbers to cheer on and clap as runners past the finish line - Mick Hickey, to the sounds of the Radetzky March, received his final applause.